Cataract Surgery Recovery - Do's and Don'ts! Cataract Surgery Recovery – Do’s and Don’ts! One general rule of thumb that should be followed when a patient is in the middle of cataract surgery recovery is to allow enough time to pass to accurately measure the results. Complications can occur with virtually any surgical procedure, but a great many of these complications could probably be avoided if the patient follows the directions of his or her doctor. Here are a few of the most important do’s and don’ts that should be followed post cataract surgery. Do go to all of your of your post surgery follow-up doctor’s appointments. In the event that there are complications, your doctor can act quickly and prevent more damage from occurring. Do keep your eyes protected from the sun and from bright lights. This is a vital part of cataract surgery recovery. 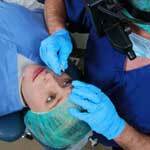 Do document any unusual findings after lens implant surgery. This may help the medical field at large to learn about new potential side effects. Do get an ample amount of sleep. With a more rested body, your cataract surgery recovery time will be cut down substantially. As long as you position yourself so that your eyes do not become irritated, you will be perfectly fine. Don’t be afraid to ask for help from your relatives, friends and loved ones if you are having any difficulties. Phacoemulsification cataract surgery is only performed when absolutely necessary, so don’t assume that you are being a burden by not recovering more quickly. Don’t put anything in your eyes besides prescribed eye drops during cataract surgery recovery. The area beneath the cornea is very sensitive, and foreign objects could cause your vision to be affected. Don’t lift objects that are too heavy. Too much weight could put unwanted stress on the eyes and potentially dislodged your lenses. Don’t poke, prod or rub your eyes. You may experience itching or burning, but it is imperative that you refrain from these activities. Don’t assume that the refractive cataract surgery didn’t work. It might take up to three months for your doctor to come to a final conclusion. In the meantime, take it easy, get plenty of rest and make your eyes your top priority.